There is no better way to explore a region’s heritage than with a group. Explore and learn together with a group tour experience. Travel back in time with a visit to one of our local museums including the Oakland B&O Museum, a restored Queen Anne style train station. Several of our communities feature self-guided walking tours. View historic structures including homes that are on the National Register of Historic Places, taking in unique architectural aspects. For an in-depth look at some of our most historic structures, make sure to include a stop at the James Drane House (by appointment) & Spruce Forest Artisan Village (in season), which offer the opportunity to a guided look inside some of the oldest standing structures in our county. In Spruce Forest Artisan Village, many local artists have taken up residency to practice their craft. Get a first-hand view of pottery, bird carving and weaving. 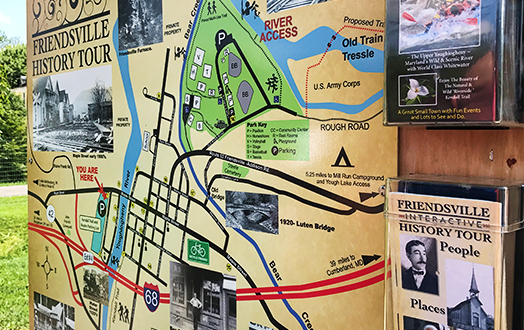 The National Road is home to many other group tour stops including the Casselman River Bridge State Park, home of the Casselman River Bridge boasting the largest single span stone arch at time of construction between 1813 and 1817. There are several National Road Inns that are still standing today. The Casselman Inn continues to operate a lodging facility along with a restaurant. Enjoy restaurants, shopping and even cheesemaking just off the National Road. Learn more about Group Experiences in Garrett County! If you are interested in bringing a group to our area, contact us to help plan an itinerary based on your group interests. Click to download a PDF of the Interactive History Tour. Maryland’s 18 designated byways encompass 2,487 miles of beautiful roads and offer a taste of Maryland’s scenic beauty, history and culture. Take the roads less traveled - including a byway featuring a nationally significant theme: the Historic National Road.